A New York-based jazz baritone/activist. Music streams from E. J. 's albums | Upcoming events | On-going notes on the jazz scene in See-Note. We hope that you'll enjoy your stay here. Look around and be sure to bookmark our site. E. J. 's CDs & downloads are available at CD Baby, Amazon and iTunes. 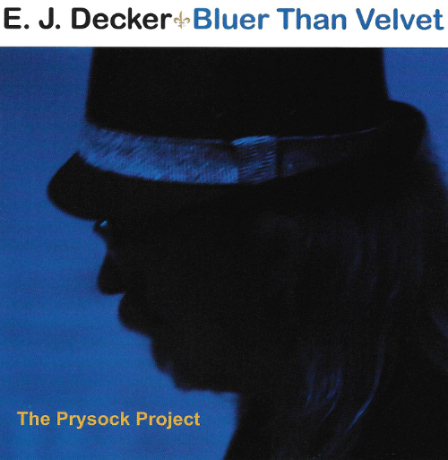 Exciting new music from deep-voiced singer / arranger / producer E. J. Decker in fine tribute to one of his core influences — the legendary baritone Arthur Prysock — Now completed and available to add to your music collection. Reviews are coming in and are beyond expectations. Radio play worldwide is ongoing. Be sure to return often to the Reviews tab above over the next few weeks for the full reviews and on-air interviews, as we'll be posting additional reactions as we receive them. Rich baritone vocals that soothe the soul and set the foundation for [Decker]’s blues-based classics. Claire Daly (baritone sax), Chris Bergson (g) and Elizabeth Frascoia (tb) provide strong accompaniment. Decker’s arrangements are fresh, crisp and appreciable. Now available exclusively at CDBaby.com. iTunes and Amazon will be added in the coming weeks. Deep thanks & appreciation to all of you who supported our indiegogo Crowdfunding for "Bluer Than Velvet" & helped gain its full Promotional Campaign! It literally would not have happened without you. Since you're shopping... grab one of E. J. 's other fine albums while you're at CD Baby! "A wild set of quiet fire"
"I just love your sound"
"Well thought out and beautifully arranged"
"A strong voice touched by that of Billy Eckstine"